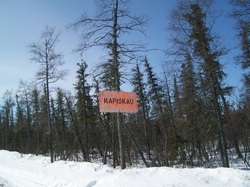 March of 2010, a group of youth, adults and elders traveled by snow machine to the Kapiskau River, along the James Bay coast, and further inland, taking steps in mapping sites and recording stories of traditional territory and trapping grounds. "Waking up to the wilderness gives some sense of peacefulness, gratification of being one with nature...our intent is learning amongst each other, experiencing the woods, listening to the elders' stories about Kapiskau, bridging the gap with youth and elders." "Interviewing the elders about this part of the land was really interesting...Mapping where we went is memorable for each student because it gives them a sense of belonging...Listening as they shared their stories about losses, hunting, trapping and how other families resided there from Attawapiskat and Fort Albany..."